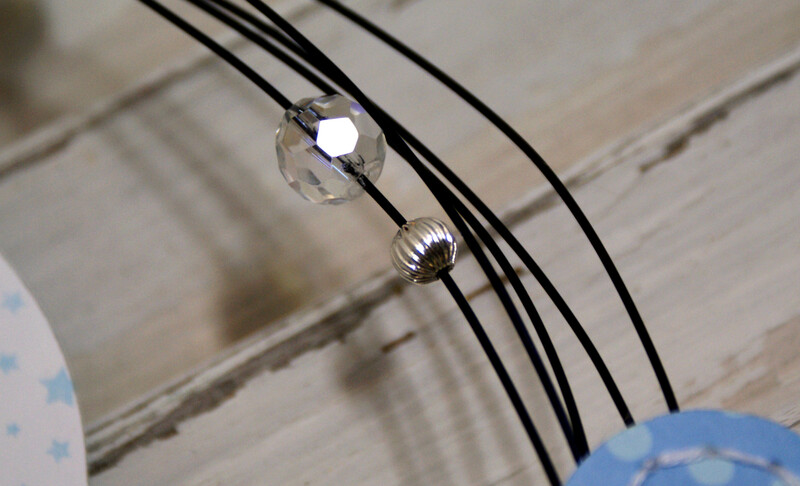 March 2014 - Pebbles, Inc.
*Be sure to hop over to Facebook and enter our Special Delivery giveaway! We’re kicking off a week of AMAZING projects featuring the Special Delivery collection. Here to start things of right is Guest Designer Sheila Burns, from Part Time Pretties, with a trio of paper craft and scrapbooking ideas using the line. Sheila is a wife, mom and crafter! 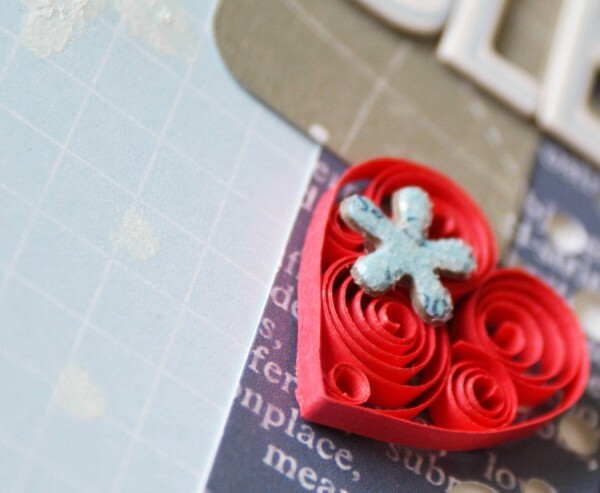 She works with many mediums from knitting to paper crafting and scrapbooking. 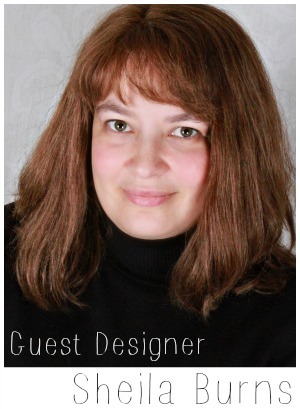 She’s also an avid blogger, providing craft inspiration to others many times a week. This fun wreath would complete any sweet little baby boy’s room. Wouldn’t it? The combination of soft and hard speaks to everything baby and a whole lot of boy! 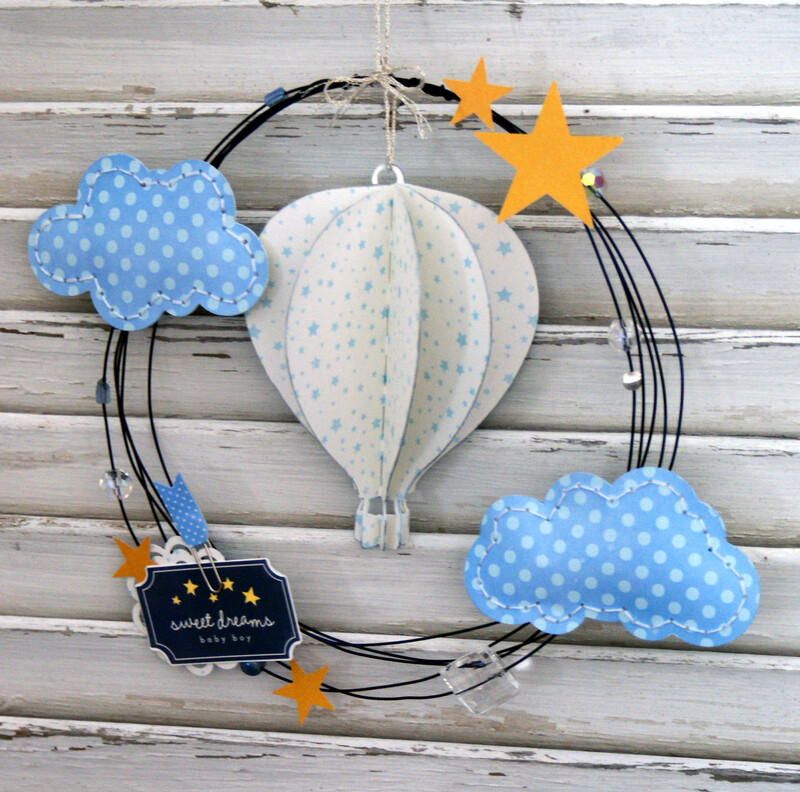 Hot Air Balloon and Clouds created using images from Silhouette. We love to see specialized, themed collections used in unique ways. This winter page was created using the Special Delivery Boy line. Snowflakes created using images from the Silhouette library. Shifting gears to the Special Delivery Girl side of things. 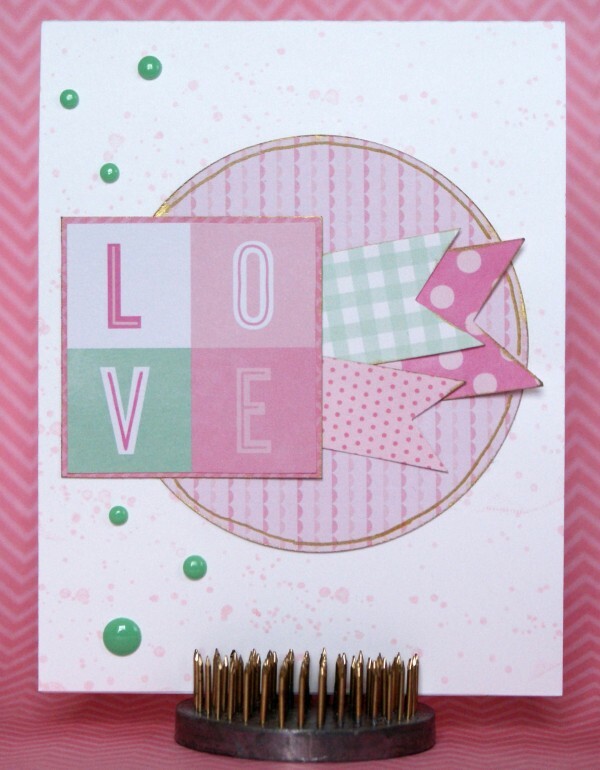 You’ve got to check out this fun “love” card. Thanks Sheila for sharing all of these amazing projects! 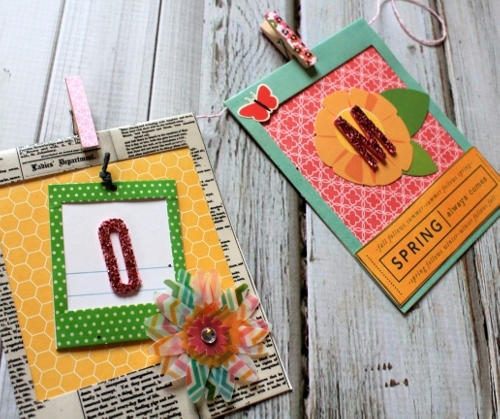 If today’s fun post doesn’t have you running out for a package of hang tag style embellishments we don’t know what will…Designer Samantha Taylor has created a fun bloom hang tag banner to decorate her home for spring! I am ready for spring, so I figured why not get my house ready for spring, too? I decided to make a spring-y banner from some picture frame hang tags and Garden Party. 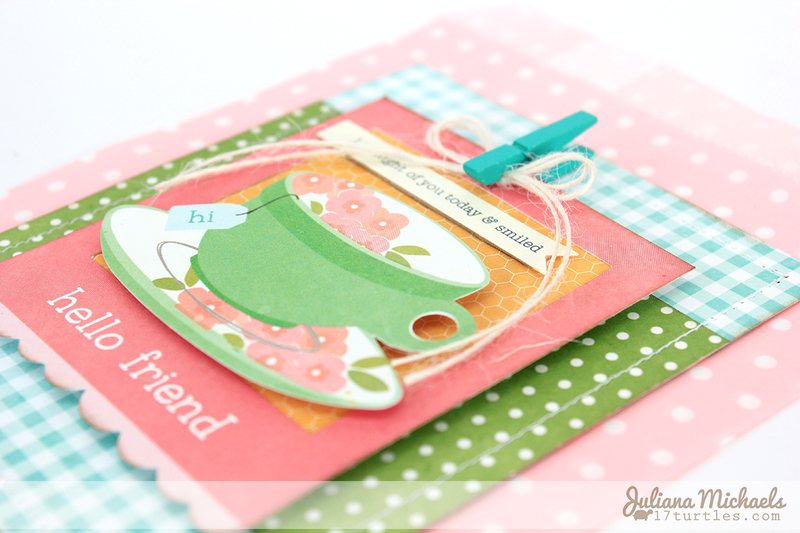 I started by pulling the hang tags I wanted to use and filling them with patterned paper from Garden Party. As you can see, I decided to use the big hang tags for my banner, but I also layer a few of the small ones inside the big hang tags. Next, I embellished the the tags and added my alphas to spell out “Bloom”. There are so many fantastic embellishments in Garden Party that I had a really hard time deciding which ones to use. In the end, I think I used a little bit of everything! I always find deciding how to hang my banner to be the hardest part. After some deliberation, I decided to thread some baker’s twine through the top of each tag. Since I had already sealed my hang tags shut, I just threaded the twine on a needle and passed it through the fold of the tag. Finally, I added some clothespins to the top of the hang tags to give them the illusion that they’re hanging on the twine from the clothes pin. Now all I need to do is find a place to hang your banner and enjoy it! 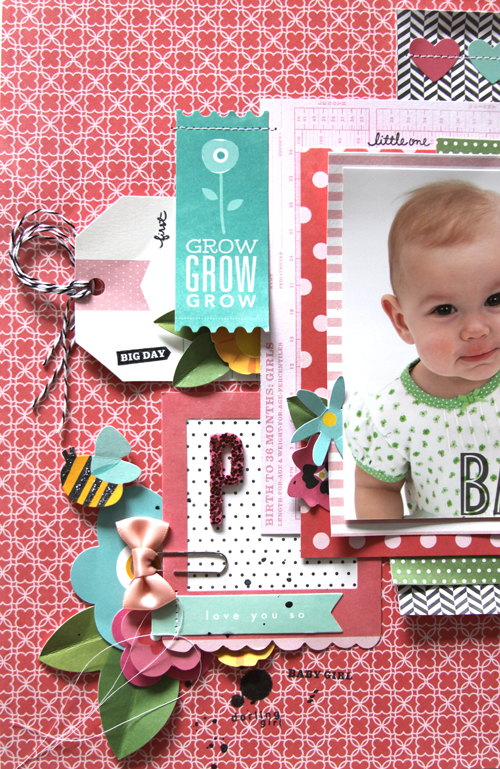 Today we have Designer Renee Zwirek, who’s sharing a fantastic baby scrapbook layout that incorporates Pebbles hang tags and frames. Garden Party was the perfect collection for this photo of Payton on her 1st birthday. She was wearing a really cute shamrock dress for her St. Patrick’s Day birthday and since there was a lot of white in her photo, the collection’s mix of greens, blues, pinks, and pops of yellow and orange were a great contrast. 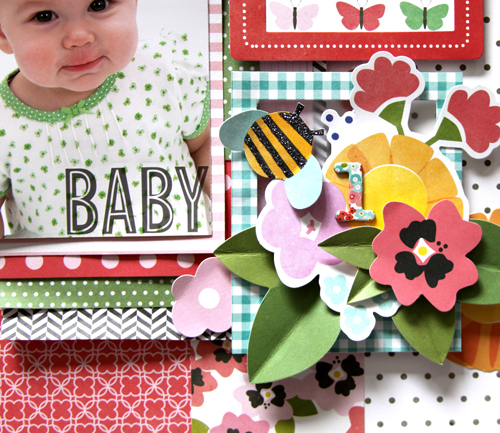 I had a lot of fun with the hang tag and frames for this layout. The designs are fun and the deep colors are wonderful. For the bracket-style frame, I paired it with the lovely butterfly pattern paper. For the blue gingham frame, I added some vellum underneath to mute the background design and layered some pretty flowers and leaves to it. 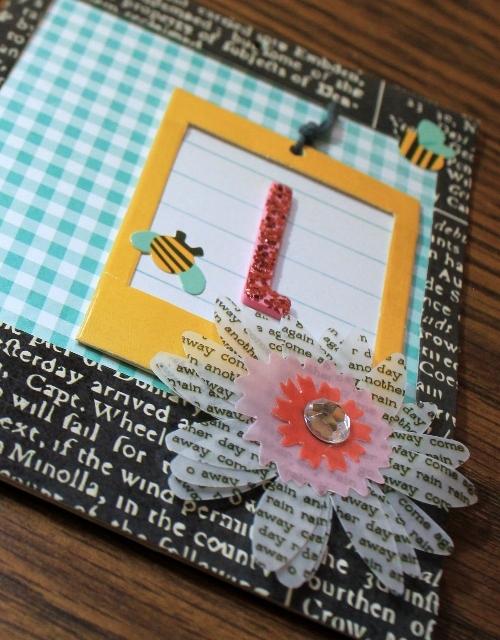 I also added a number Thicker for her age and an adorable bumble bee, with some Graphite Zazz! Glitter Glue to the bee’s stripes. For the pink scallop frame, I added a black polka dot pattern paper. I machine stitched a “love you so” sentiment banner to the frame and added a sweet paper clip with bow. I also added a glitter foam letter “P” Thicker for her name. The “BABY” Watermark Rub-On works out perfectly and was placed in the corner of the photo. Baby is our nickname for Payton. In this case I did put baby in the corner, but it has nothing to do with that famous movie with that famous line. I used a hang tag in my layering and added twine and some fun phrases to it. We’re loving the clean, simple grid style showcased in Designer Kim Kesti’s “Happy Place” scrapbook layout. 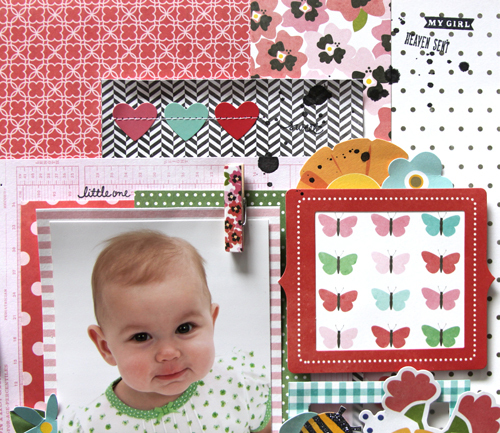 Using frames and tags from any of the Pebbles collections are perfect for grid style scrapbooking. Whether you use pocket pages or a traditional 12 X 12 format like I did, lining up a fun combination of hang tags and frames is a great technique for quick and easy pages. 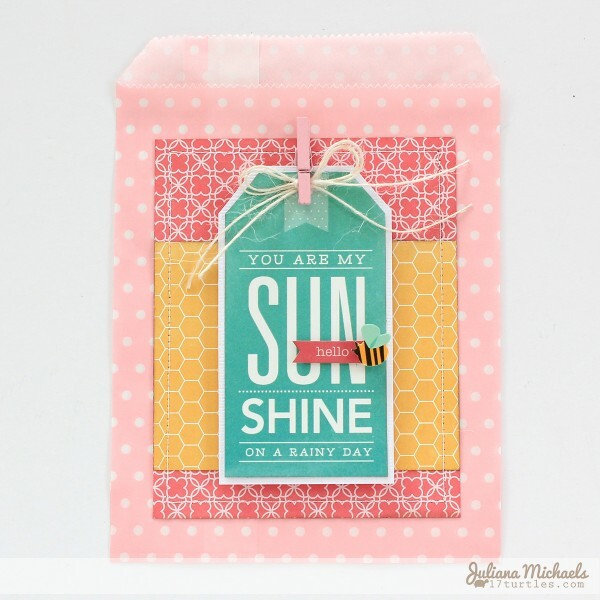 I love the tiny black and white chevron pattern, so I purposely used three of the elements (a clothespin, washi tape and a pocket embellishment) to create a visual triangle. This gives my page a lot of interest, along with great balance. We’re always looking for great ways to dress up a basic. 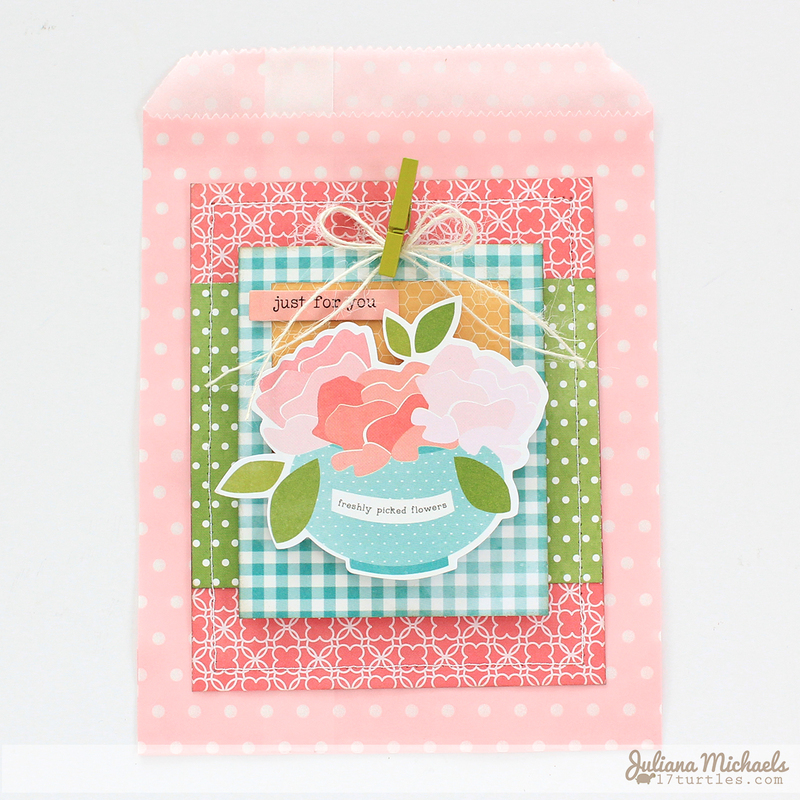 Today Designer Juliana Michaels is sharing a collection of fun gift bag tags she made using the Garden Party collection. Hello and Happy Spring! When I was first asked to create a project using some of the Pebbles frames and tags, the first thing that came to mind was a banner. I quickly dismissed this idea, because we’ve had some awesome banners shared already on the Pebbles blog by the Pebbles Design Team and decided to keep brainstorming. I finally settled on the idea of creating a set of Garden Party gift bags using the new Special Delivery Baby Girl Printed Bags and some frames and tags from the Garden Party Cardstock Die Cuts pack. 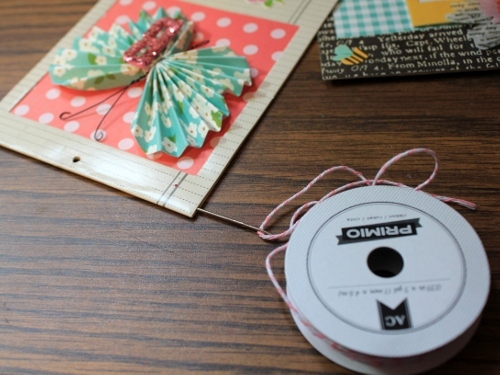 Create a base piece by cutting a piece of patterned paper to 4″ x 5″. Ink the edges. 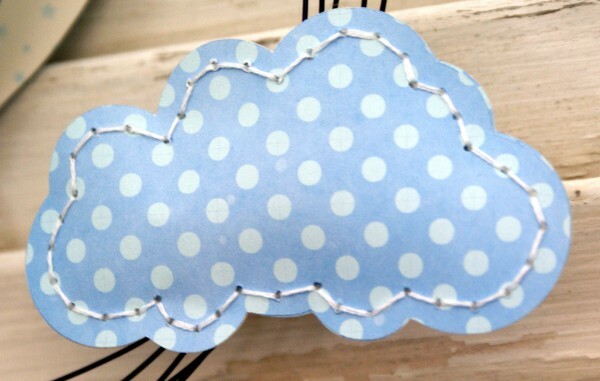 Cut a 3″ x 4″ band from patterned paper. Ink the edges and then center this piece horizontally on the base piece. Use a sewing machine to stitch a border around the outside edge. 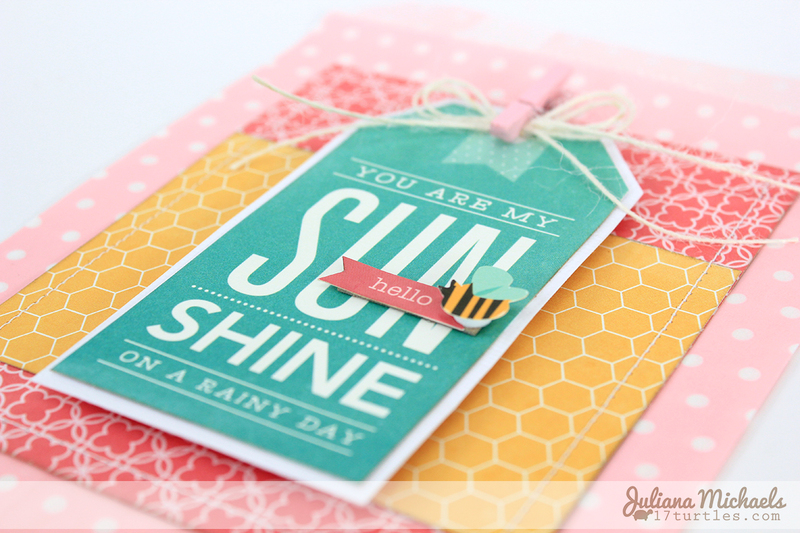 Select one of the die cut frames and cut a piece of patterned paper to fill the opening. 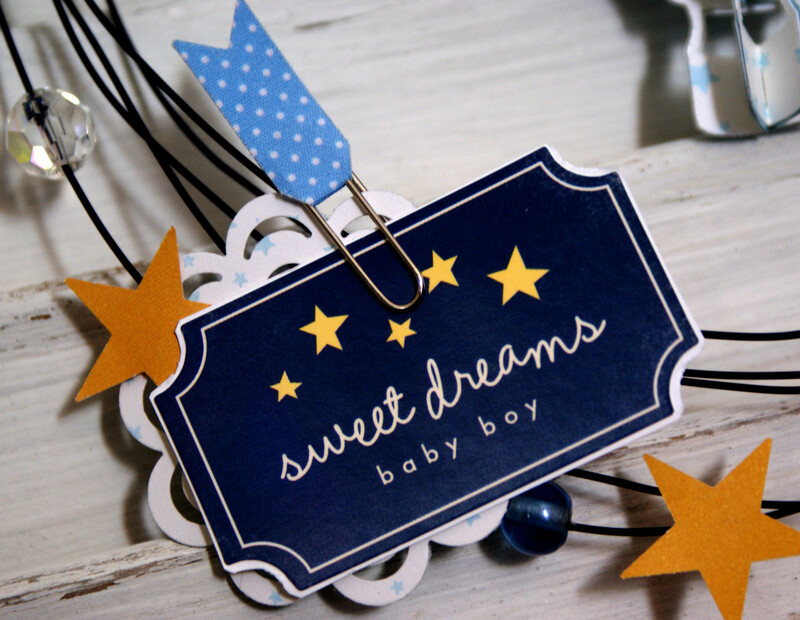 Select a die cut shape and attach it to the front of the frame with dimensional foam tabs. 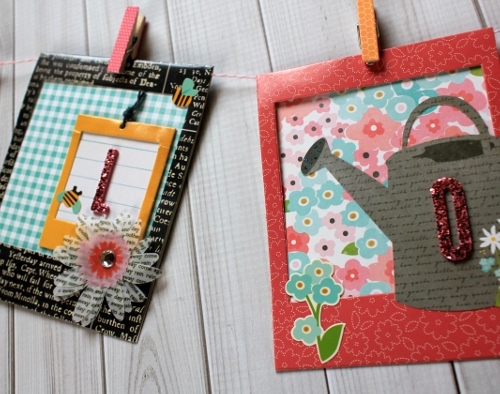 Attach embellished frame to patterned paper base with dimensional foam tabs. Cut two 9″ lengths of jute and tie into a small bow. 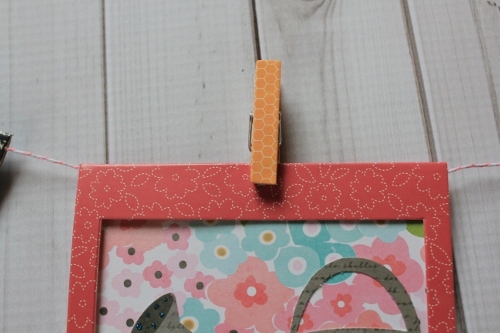 Attach to frame with Mini Clothespin. Attach completed piece to front of bag. 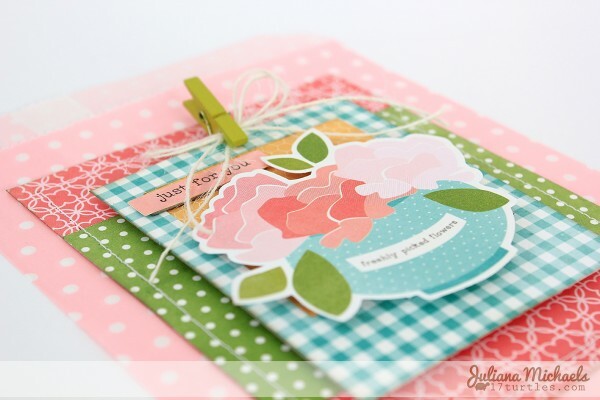 Repeat this process using other frame and tag shapes from the Garden Party Cardstock Die Cuts pack. 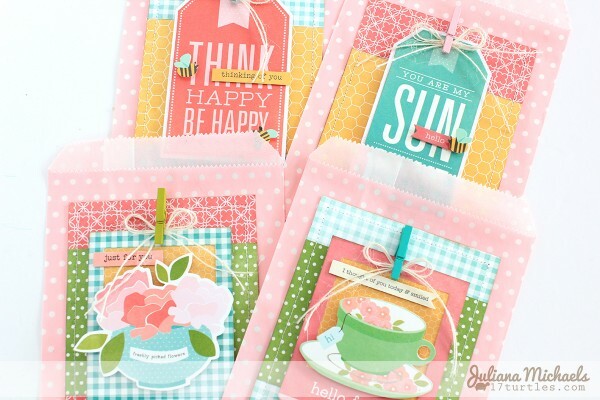 I think these would be perfect to use as gift bags for a spring themed Garden or Tea Party. Can’t you just see them filled with a packet of seeds or some of your favorite flavors of tea?